You might remember the newest book I posted about last week, The Beauty of Zentangle also has a tangled bird on its cover. In this video Suzanne talks about her process for drawing birds and decorating them with her tangles. 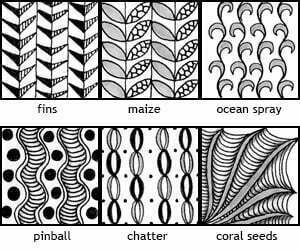 This looks like it might be a fun summer project for introducing children to Zentangle. Thanks so much for posting this. I was just thinking about tangling an animal. This just gave me so much more motivation! That was so cool! Taking a bird and tangling it up like that! I liked the tail feathers! Thanks Linda for posting that video……..so far I haven’t ventured into tangling animals or birds etc, but this video has given me a little bit more confidence to try something…..”outside the square”…..as it were ! She makes it look so easy to do! the bird tangle video was wonderful. I loved the tangles you selected for it. Moreover, I liked how you broke the tangles down to easy steps and encouraged us to use them as a guideline and modify them as necessary. I can’t wait to use tangles in my fuse glass. Love OMG. This is so interesting. The bird video is awesome , I did a part of it , but was too busy watching you work and explain how to draw at the same time. Will look forward for more and practice thx a lot ???? Thank you for posting this video as it is so helpful to see the tangles being drawn. Suzanne McNeill is very talented and an inspirational teacher. Will try this!